​On Friday, July 21, PIPC hosted a discussion panel entitled “Uses and Misuses of the QALY: ​Ethical Issues and Alternative Measures of Value,” centered around the use of quality-adjusted-life- years by both researchers and policy-makers through the lens of creating a more patient-centered approach to measuring value in health care. 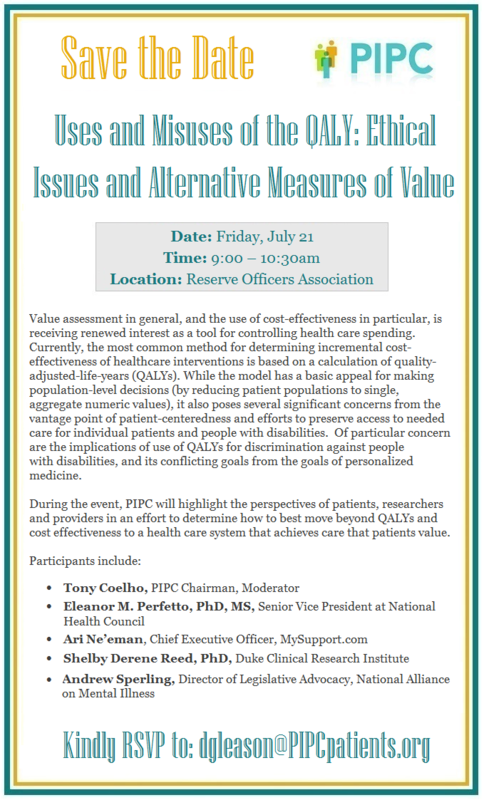 The event followed the publication of a briefing paper by PIPC explaining the methodology for calculating a quality-adjusted-life-year (QALY), how it is used in cost effectiveness analyses, its implications for discrimination against people with disabilities and serious chronic conditions, as well as alternative patient-centered approaches being developed to align with assessing value to the patient. PIPC Chairman Tony Coelho explained the issues surrounding the use of the quality-adjusted-life-year (QALY) as, “the academic is trying to determine whether the extra dollar spent is worth it. The health insurance company or policy-maker is telling us whether WE are worth it.” He explained that there is a renewed interest in cost effectiveness using the metric of a quality-adjusted-life year to determine the value of a test or treatment. He described an over-emphasis on reducing treatment costs, without consideration of personal and societal costs. Chairman Coelho emphasized the need to understand how policies provide or limit our access to care, and use our voice to ensure policymakers are getting it right. PIPC’s Executive Director Sara van Geertruyden explained that federal agencies such as the Veterans Administration (VA) and state health agencies through Medicaid are increasingly using cost-effectiveness analysis to determine access to care, or proposing to use flawed tools to support their coverage decisions. She defined a QALY as a measure developed by health economists to compare healthcare interventions for cost effectiveness, which differs from comparative clinical effectiveness that compares clinical and patient-centered outcomes without reference to cost. Instead, QALYs seek to measure and distill the impact of a treatment on quality of life down in a single number using surveys that have methodological challenges. In 1992, HHS rejected Oregon’s prioritized list for Medicaid citing the potential for violating the ADA due to use of QALYs. Therefore, policymakers prohibited the Patient-Centered Outcomes Research Institute (PCORI) from using the cost-per-QALY to determine effectiveness, and further restricts its use in Medicare to determine coverage, reimbursement, or incentive programs. She also described work on alternative measures of value that will empower doctors and patients to determine treatment effectiveness based on outcomes that matter to patients. Jason Harris, Manager of Public Policy at the National Health Council, discussed with NHC’s patient-centered value model rubric, as well as their qualitative research on how patients define and describe “value” as it pertains to their care and quality of life. Mr. Harris also questioned how QALYs can be the “gold standard” if it is widely criticized across the health care industry, especially from patients. Dr. Shelby Reed of Duke Clinical Research Institute defended the QALY metric as helping to maximize total health benefits from the limited resources available. She explained that while researchers recommend generic preference-based measures and community-based preference weights, the QALY should not be the sole source for allocating resources. She advocated for broader value frameworks and gave an example of her current research to measure the value of hope in a patient’s treatment, which is considered to be a patient-centered outcome sought by treatment. Dr. Reed said that QALYs are considered alongside of many other factors such as equity, ethical concerns, and benefit for others, and while it does have flaws, it can promote transparency in decision making, since it lays out the assumptions in measuring cost-effectiveness. Mr. Ari Ne’eman joined the panel from mysupport.com, an online platform to connect people with disabilities to empower self-determination. As a passionate disability rights advocate, Mr. Ne’eman discussed how general public surveys over-estimate the burdens associated with life with a disability, and discussed research that shows that after a period of adjustment, people with life-long disabilities do not have lower long-term happiness. He also examined how QALYs force a choice between access to specialized health care and non-discrimination of the life of a disabled person. People with complex disabilities fear that physicians will not value their life over the per capita health care cost associated with their care. Mr. Ne’eman noted that the medical model of disability contrasts with the social model of disability, since a disability is not the same as a sickness. Mr. Andrew Sperling joined from the National Alliance on Mental Illness and has been integral to PIPC’s work to create an engagement infrastructure for patients in policymaking. He discussed how QALYs are a poor way to measure what matters to people with mental illnesses, as patient-centered outcomes such as social connectedness are often the most important to people with a severe mental illness. In light of the recent partnership between the Institute for Clinical Effectiveness Review (ICER) and the Veterans Administration, Mr. Sperling instead urged a more patient-centered perspective in coverage within the VA, fostered by patient engagement and more transparency in the decision-making process, as opposed to reliance on cost-per-QALY assessments that tend to limit access and coverage. ​​The panelists agreed that the healthcare system should be transparent with regard to the evidence supporting coverage decisions so that these decisions are not made in a black box. While the cost-per-QALY metric may be useful in academia, it should not be the sole source of a coverage determination or health care decision. People with disabilities and serious chronic conditions have a deep understanding of their needs and goals for treatment, and must therefore have information that supports personalized health decisions. Patient representatives on the panel expressed deep concerns that a cost-per-QALY metric for determining value in health care is used to discriminate against people with disabilities and serious chronic conditions, and urged that public programs such as the VA health system and Medicaid steer away from using cost effectiveness analyses generated by organizations such as ICER, and instead engage patients in determining value.